The SmartCafe Expert SDK from G&D is a complete development environment to develop, test, integrate and customise Java card applications with SmartCafe Expert cards. 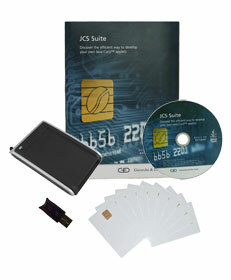 The SDK package comes complete with 10x SmartCafe Expert 3.2 144K dual interface cards. Also included is the G&D SmartCafe Expert SDK including tools, card emulator, development environment and full documentation, an SDI011 dual interface smartcard reader and a software license dongle. Further supplies of the cards included in the SDK are available from our online store. Please note that this SDK does not currently support SmartCafe Expert 6.0 cards. Advanced programmable Java card with 72k on-board storage. Advanced programmable dual-interface Java card with 144k on-board storage.